Do you suppose we need a tractor for the Manse? The short answer to that question is no, of course. But because when I lived in the Manse as a child the back and side yards were filled with my dad’s tractor, front-end loader, various trailers and a truck or two – as those who knew him will tell you, he wasn’t your typical man of the cloth – it seems only natural to me that we should have a tractor. What would we use it for? Who knows? But surely we’d figure out something. 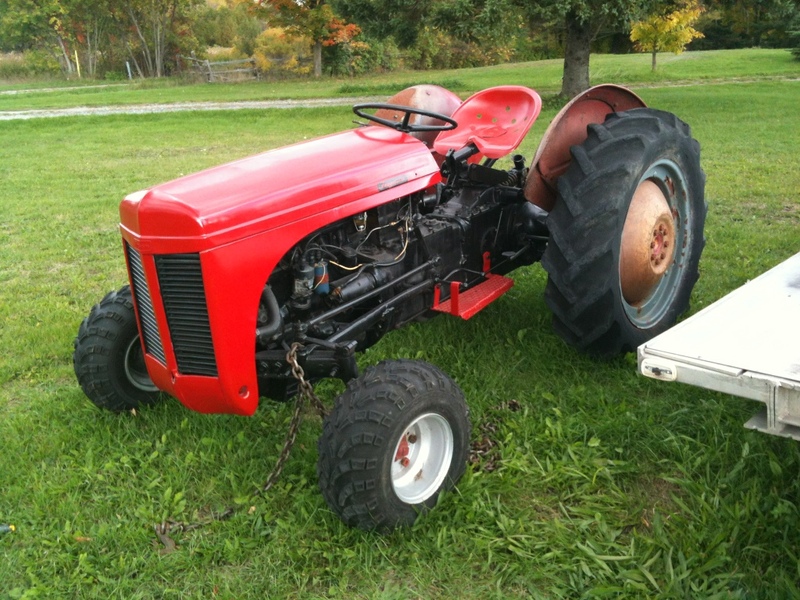 This vintage red one, a Ferguson (i.e. from before Massey came along), has been sitting out front of a house on Highway 62 with a “for sale” sign on it for a while now. Aside from the oddly modified front wheels, I think it’s quite cute. And it would match Raymond’s red truck! What do you think, people? And those people will think (and they will be right): Okay, it’s a Manse, but it’s also art. Which it is. Thanks to Dave, who made it so. It suddenly strikes me that food has been the theme of this blog the last couple of days, what with yesterday’s post about my search for a Hastings County turkey for Thanksgiving and all the interesting local farms I found as a result. Well, what’s wrong with a food theme? Good food is something to celebrate. 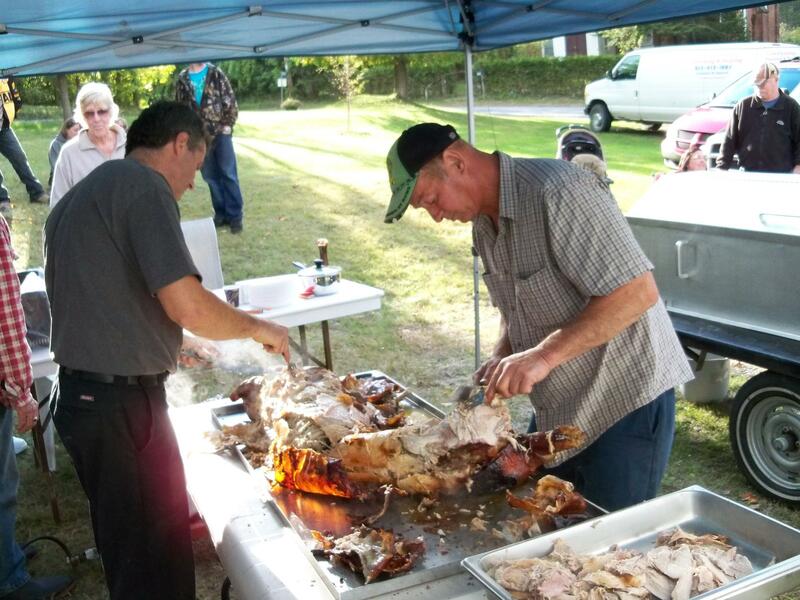 And good food was what it was all about at the community pig roast in Queensborough last Saturday. 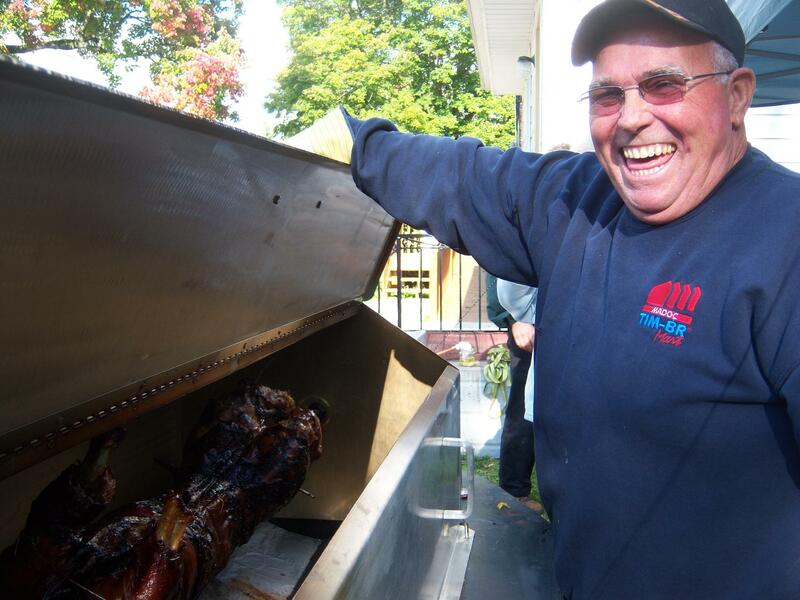 As I’d previously mentioned, Raymond and I had very much hoped to be on hand for it (Raymond especially; “Nothing beats a pig roast!” he pronounced in his Facebook post on the subject), but it turned out we had a prior engagement in Montreal – the opera, if you must know. And La Traviata was great, but evidently we missed an excellent meal and gathering at the Queensborough Community Centre. I love the photo above, because it’s classic Queensborough. 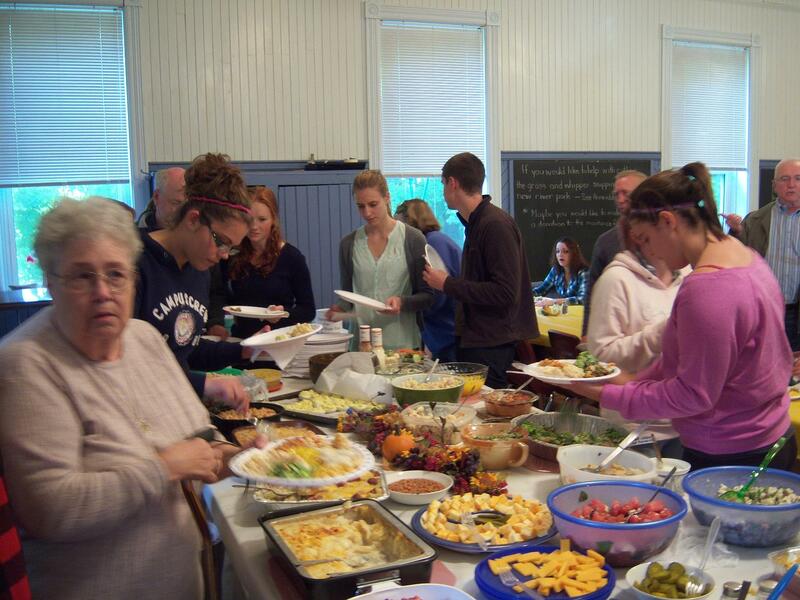 Just look at that table groaning under its burden of great homemade food! I tell you, people, no one knows how to put on a spread like these folks. 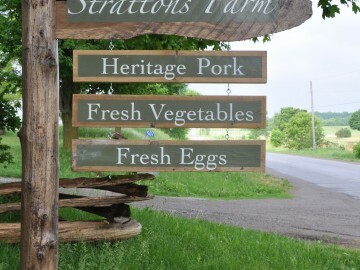 A terrific sign of the times in Hastings County: this is the sign at Strattons Farm, one of a number of local producers treating the earth sustainably and well and offering great food to those of us lucky enough to live (even if, in our case, it’s only part-time) in the area. I took a day away from work today to try to cross a few things off my endless (and growing) to-do list in my “civilian” life. One of the more urgent things on that list was to order a turkey for not-far-away Canadian Thanksgiving, when the extended Sedgwick family (and friends) gather at the family homestead in Haliburton County for the annual feast. 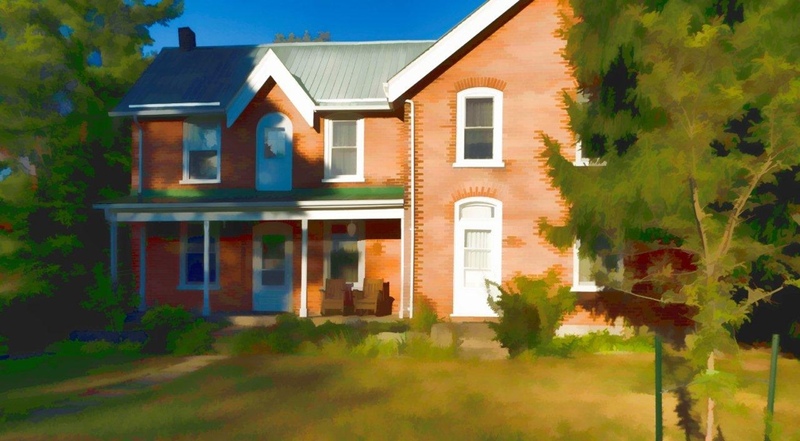 This year, for the first time since I was growing up at the Manse back in the 1960s and ’70s, I’ll be heading to the family gathering from Queensborough, where Raymond and I will be based through the long weekend. So I decided I’d try to order a fresh turkey from one of the farms in the area that sell that products directly to the public. Long story short, we have a nice 30-pound turkey on hold for us from the farm of Tim Hunt just south of Tweed. But long story long(er): I had a most pleasant couple of hours conversing by phone and email with farmers in central and southern Hastings County as I carried out my search. I found out: one, I should have ordered a turkey months ago – these are small farms with limited production, and their coveted products go quickly; and two, there’s a great community of people committed to raising healthy, frequently organic, food in Hastings County. Linda Squibb of Misty Ayr Farm in the Stirling area, where they raise “Berkshire pigs, Katahdin sheep, Bronze turkeys, meat chickens and Peking ducks in a natural environment.” Linda tells me the Bronze turkeys have a darker meat than traditional white turkeys. I am anxious to try one, but of course was too late for this Thanksgiving. And of course Tim and his mum Dorothy Hunt of Countryman Road outside Tweed, the providers of our Thanksgiving turkey, raised in the heart of Hastings: a place where good local food is grown, raised – and appreciated. When Raymond and I visit the Manse for a weekend, we often drive in on Friday night after work in Montreal – and since it’s a four-and-a-half-hour drive and our workday never ends early, that means we always get in quite late. While the drive is long, it’s a pleasant one; we take mostly back roads, though the next-to-final stretch is the 60-odd-mile drive on Highway 7, the Trans-Canada Highway, from Perth, Ont., to Queensborough Road just west of Actinolite. Then again, while Highway 7 may be the Trans-Canada Highway and a main route through the area, it’s a quiet area – and the highway is like a back road compared to the wide and busy 401 not all that many miles south. Anyway, it’s always a lovely feeling to turn north off 7 and onto Queensborough Road, knowing that in a few short minutes we’ll be at the Manse. There are no lights along that road save for the odd house light that might still be on at that late hour, and the darkness means two things: one, you have to watch out for the local wildlife (raccoons, skunks, turtles, porcupines, frogs, muskrats, deer) that might be on or crossing the road; and two, suddenly, if it’s a clear night, you can see the stars in all their brightness and magnificence. I love looking at the stars on a clear dark night, more so since I’ve lived in the city where one really can’t see them. My father was knowledgeable about the stars and constellations, and I have very happy memories of him pointing them out to me. (I wrote here about the time he and I visited my aunt and his sister, Marion Sedgwick, when she was on a mission posting with the United Church of Canada teaching nursing in remotest Papua New Guinea, and he got up night after night to scan the skies so he could show me the Southern Cross.) 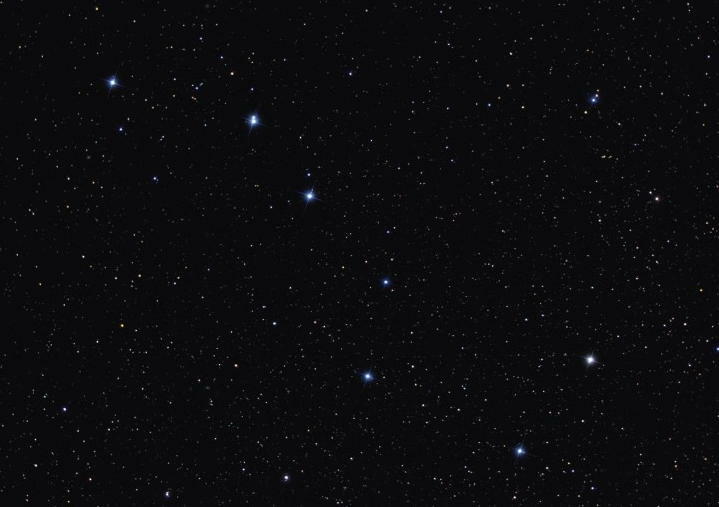 Mind you, I never quite got the hang of those constellations; the only one that I ever could and still can actually find on my own is the Big Dipper, which I’ve been looking for in the skies since I was a tiny child and that always seems like a comforting old friend when I find it. Which I did on the most recent late Friday night. As we drove the last few miles to the Manse along Queensborough Road, the Big Dipper was straight ahead and above us. Shining right over Queensborough. A good sign. A nice hefty piece of fieldstone now covers the Manse’s old well. 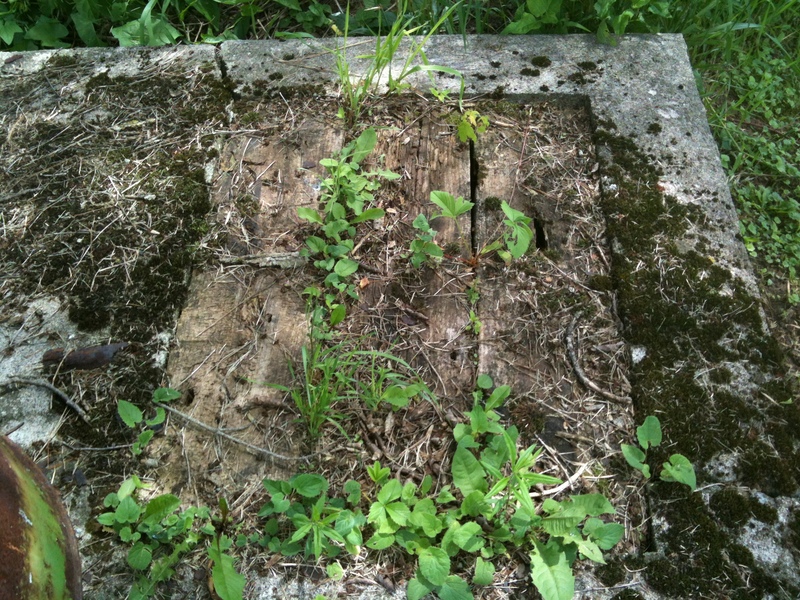 The former covering for the well – an accident waiting to happen. A while back I posted a warning to anyone who might come visit the Manse to not, under any circumstances, step on the cover of the old well that is no longer in use. That cover is a cement square, inset into which are some boards that are not trustworthy at all, given how long they’ve been there and the greenery growing up through them. We wanted to put something over those boards that would ensure no one would or could step on them (and potentially fall through), but we wanted it to be something attractive. 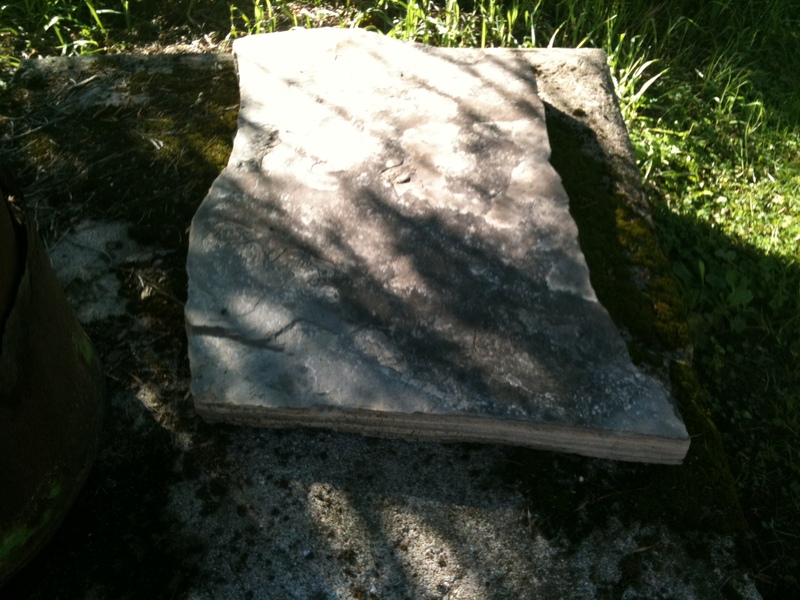 Our hope was for a piece of nice local stone. So we asked Mike Tregunna, owner of the Tregunna Tree Farm outside Tweed from which our new elm tree came, about it – since the Tregunna folks are in the landscaping business as well as the tree business. 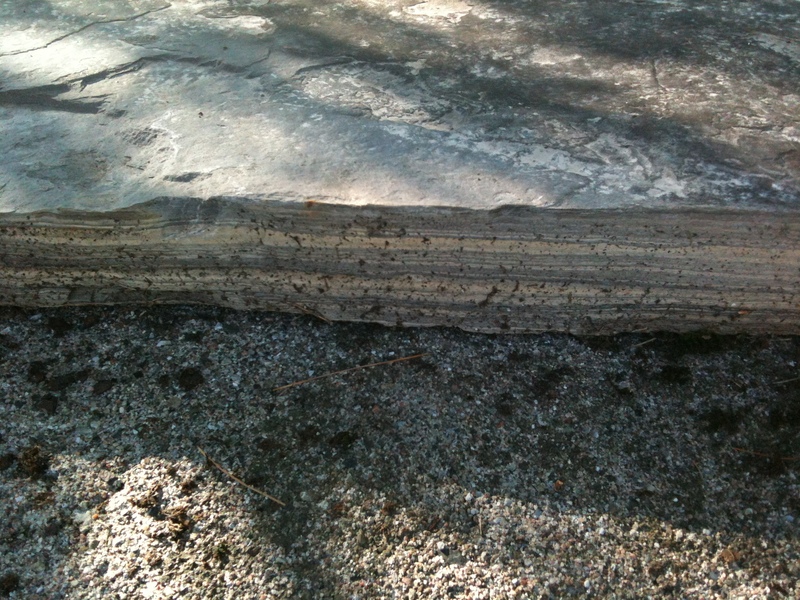 A closeup: I like the different-colored layers in the stone that Mike Tregunna found. Mike promised to keep an eye open for a suitable piece of natural stone, and a couple of weeks ago he emailed me saying he’d found one at a good price. And now it’s happily installed, preserving us all from danger. And looking good to boot. What a great vehicle! 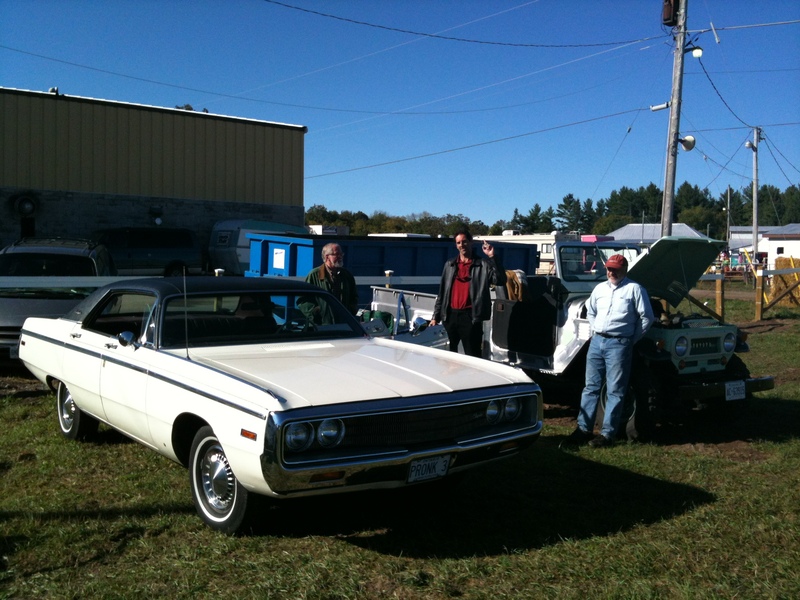 Don Huff (right), the proud owner, and Jos Pronk (left), the guy who made it, at the Madoc Fair Show and Shine. It’s a proudly Made In Queensborough collaboration. Queensborough is a quiet enough place that when someone drives past your house, chances are you look to see who it is. So when I heard a car passing last Saturday morning as Raymond and I were getting ready to go to the Madoc Fair, it was natural that I would glance out the window. “Don Huff just drove by in some kind of cool-looking vintage jeep,” I told Raymond. Little did we know just how cool that vintage vehicle was. How cool? 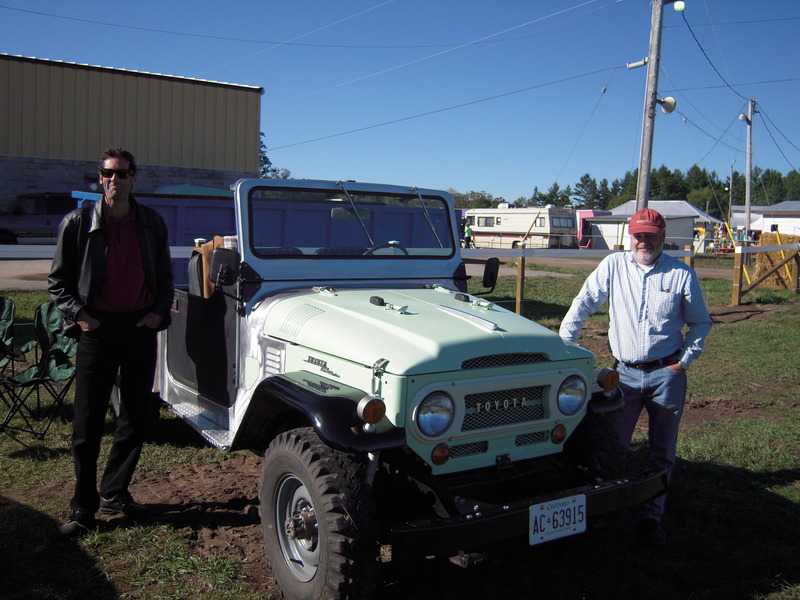 Well, as we found out a little later that day, it’s a vehicle built around an old (from the 1960s, I believe, but please, anyone who’s reading this who’s connected to the “car-hand-made-in-Queensborough” project, correct me if I’m wrong) Toyota Land Cruiser base. But the spectacular thing about it is that it has all been hand made in Queensborough by Jos Pronk, who owns and runs Pronk Canada Inc., situated in what was once Bobbie [Sager] Ramsay’s general store. Early in our Queensborough adventure we had heard about how skilled and talented Jos is. The short version of what we were told: “He can make anything.” Here’s the slightly longer version, his company’s official blurb: “Art design, repair of equipment, AutoCAD, manufacturing of new equipment & attachements, making of obsolete parts, specialty welding in stainless & aluminum, machining & fabricating of complete machinery, manufacturing & designing of artistic iron work, fencing, railings & gates.” I think you will agree that that is pretty impressive. 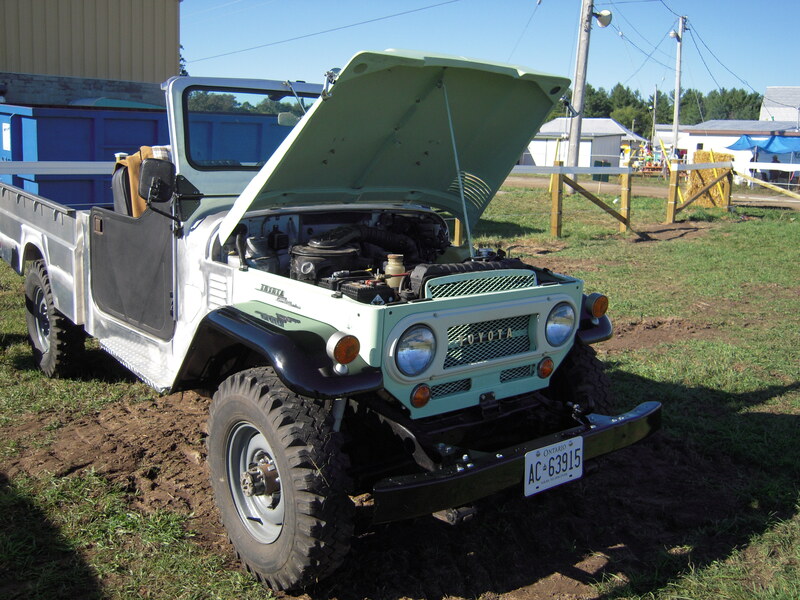 Don – who, like us, divides his time between work in the city and down time in Queensborough – acquired the old Land Cruiser some years ago and wanted to do something interesting with it. Fortunately for his project, he was just down the street from Jos Pronk. It took Jos four years. Four years! Every part, every section, was hand-machined, and there was an extraordinary amount of design work involved as well. And last Saturday morning when I saw Don drive by, he had just taken possession of the finished product. A momentous day for both Don and Jos! 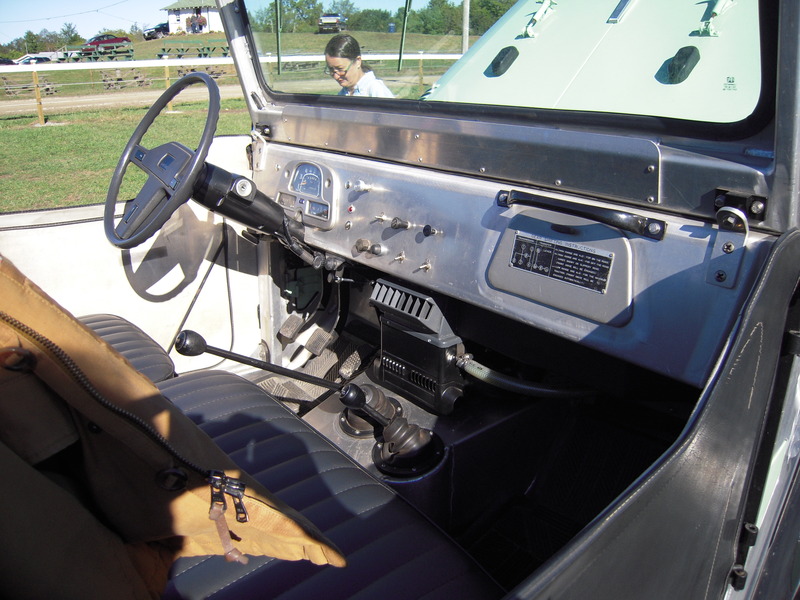 The long view of the hand-made vehicle. Jos Pronk’s own vehicle at the Show and Shine, a 1970 Chrysler Newport Custom. The hood alone is six feet long! 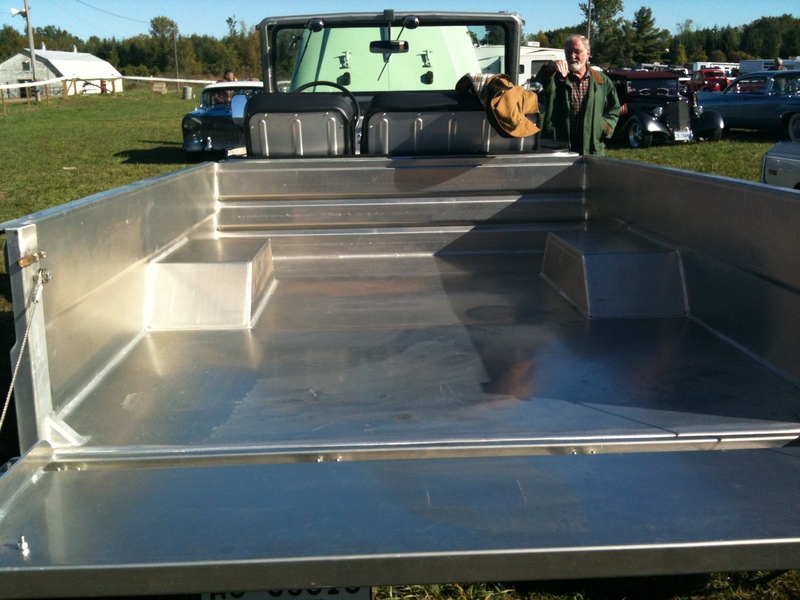 The back of the made-by-hand vehicle. 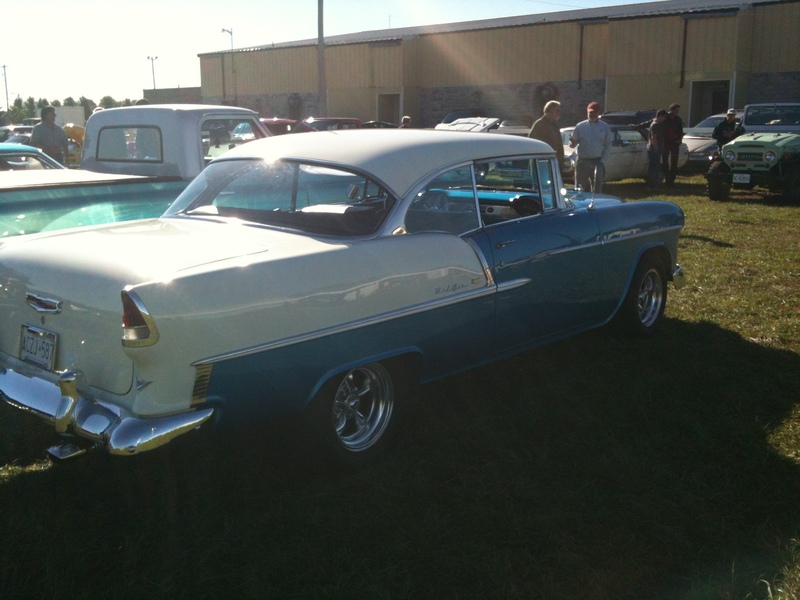 A ’56 Chev that was at the Show and Shine. It reminded me of my dad’s beloved ’56 Chev, which was the car in which our family arrived in Queensborough in July 1964. 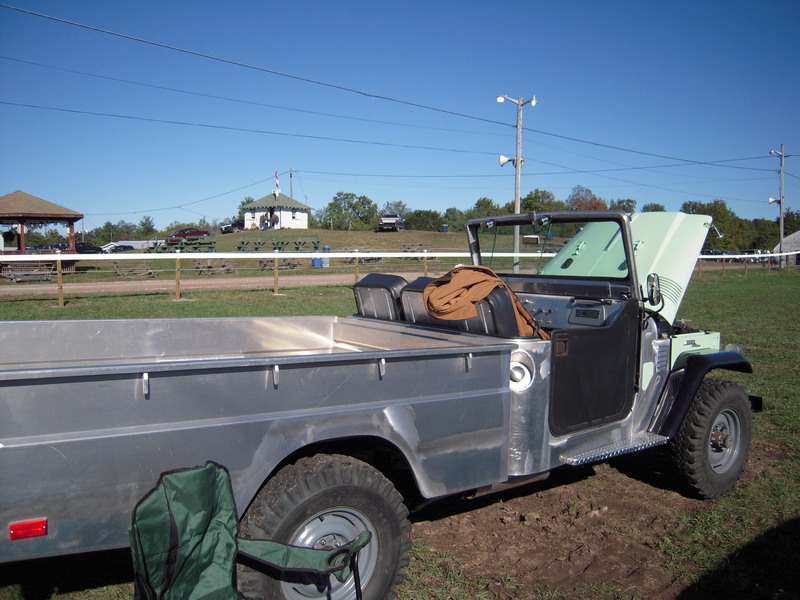 Last Sunday morning, the vehicle was on display at the Madoc Fair’s Show and Shine event, when owners of vintage vehicles put them on display for auto and design aficionados to admire. Of course Raymond and I – who had already enjoyed a gloriously slow-moving Saturday watching the horse pull (the drawing match) at the fair – had to be back for that. I mean, how often do you get to see a beautiful vehicle hand made in Queensborough? And hang out with the owner and the man who made it? And most fun of all, get to watch the people who love cars oohing and aahing (and asking a lot of questions) about a one-of-a-kind vehicle the likes of which they have never seen before? That is one cool car. Hand made in Queensborough!